Mumbai. 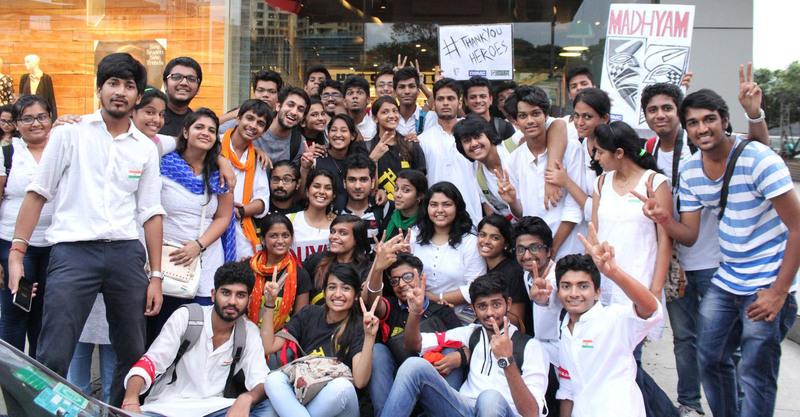 On the memorable day of 15th August 2015, Theatre group ‘Madhyam’ of Deviprasad Goenka Management College of Media Studies along with Team Mumbai Media Champs (Media Festival of DGMC) performed ‘Nukkad Natak’ to pay Tribute to all our heroes‘Thank You Heroes’and everyone who helped in getting independence. The team performed a small skit which included faults and achievements of our country, about the sacrifice done by our freedom fighters. Song which tells us about our revolutionaries like Chandra Shekhar Azad,Bhagat Singh,Captain Manoj Pandey,Captain Vikram Batra and Major Sandeep UniKrishnan and their cede .The end of the skit displayed the mark of unity and fieriness of SARFAROSHI.It was directed by Mr. Anshul Rai and headed by Miss. Charmi Saraiya. Rajesh Yadav ,Kajol Shah,Piyush Shinde, Archita Rai,Vandit Jaswani,Viraj Soni,Pruthvi Umaretiya,Ishaan Chordia,Smritika Shrivastav, Hrishikesh Damodar are among some of the actors who performed.They performed in almost every hook and corner of Mumbai from town to suburbs which included the Inorbit Mall,Malad( West) ,Oberoi Mall,Goregaon (East), Mumbai etc.The team received superb response from the crowd for their 15 mins skit and they also interacted with the audience. A great day for team Madhyam and team MMC.